This compact range of industrial machines are aimed at the general repetition user where the feed system is enclosed within the unit. 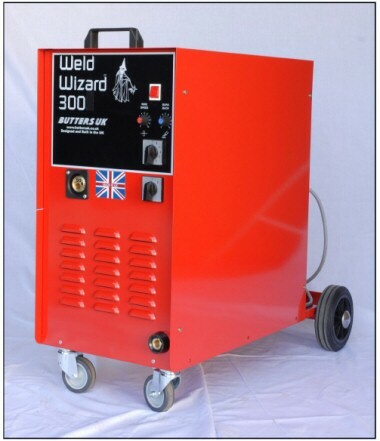 Easy movement from welding bench to welding bench. Good size wheels for the maneuverability, with laser cut panels for excellent fitting of components in these 40% duty cycle machines. The parts used in these machines are of the highest quality. Large cooling fans for prolonged performance runs. Dual overload control for greater protection. We have fitted the latest 2 roll system, 0 to 22mpm, capable of taking 0.6mm up to 1.2mm (3PH 3003)wires. The industrial drive roll has both wire sizes on it and only requires being reversed to change sizes. The drive system is totally electrically insulated and finger proof. All the drive gears are enclosed in the gearbox. Due to the design from the motor through the gearbox it gives20% more torque than our competitors. Each machine takes a 5 or 15 kilo reel and full size bottle. Viewing our drive system against our competitors you will see it’s superior quality and robustness. Butters-UK. Designed and built in the U.K.
Our policy is of continuous development and we reserve the right to change this specification without notice.